Looks great! 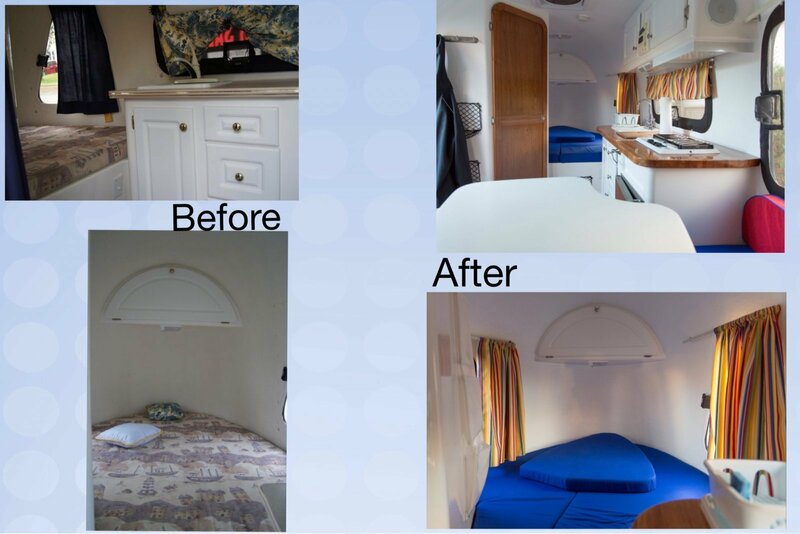 The fresh new fabric colour inspires me to replace the exact same fabric in our trailer. How did you construct the table leg (looks interesting). 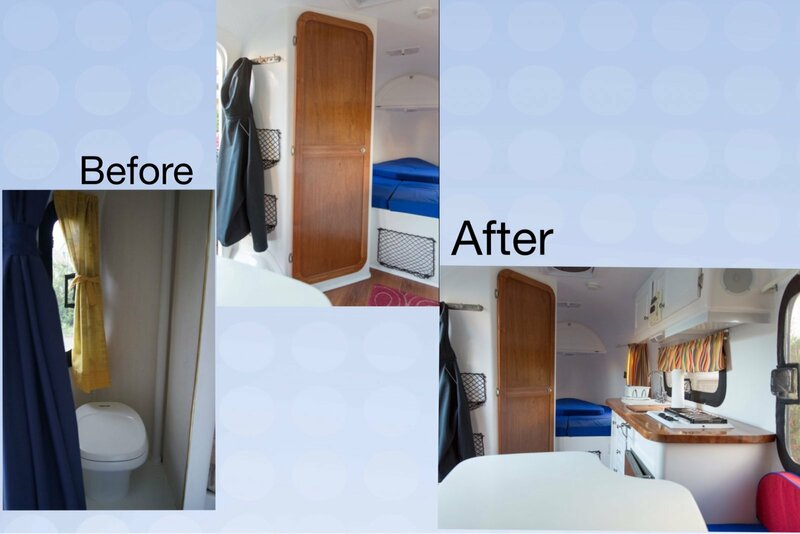 We are mulling over whether to try to add a "hatch" to the rear of the trailer (similar to boat hatches), to allow access to the under bed storage, which can be difficult to access. Try a boat yard for fiberglass repair and painting. For gelcoat repair and painting, check with Paul Neumeister (A1 Auto Refinishing) in Sebringville, Ont. He has a Boler 1650 (!) and has substantial experience with FGRV body and mechanical work. I highly recommend him for this type of work. 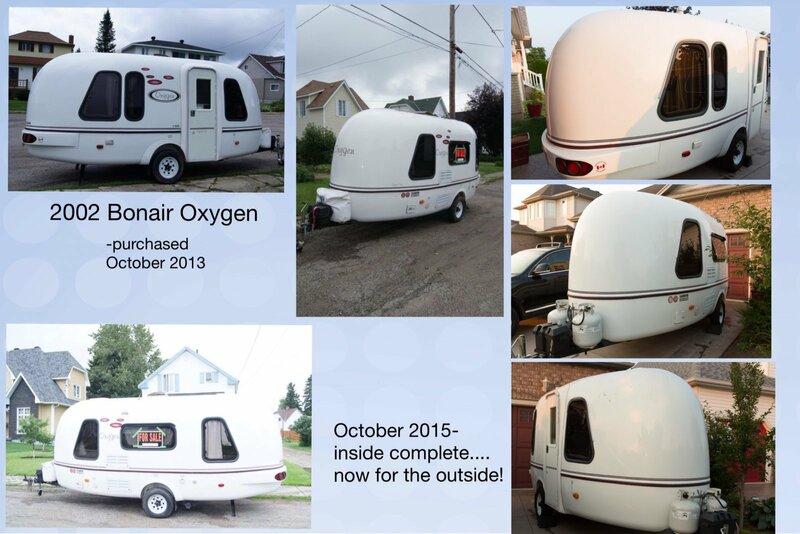 I bought a Bonair Oxygen trailer 2 years ago and have been making modifications. 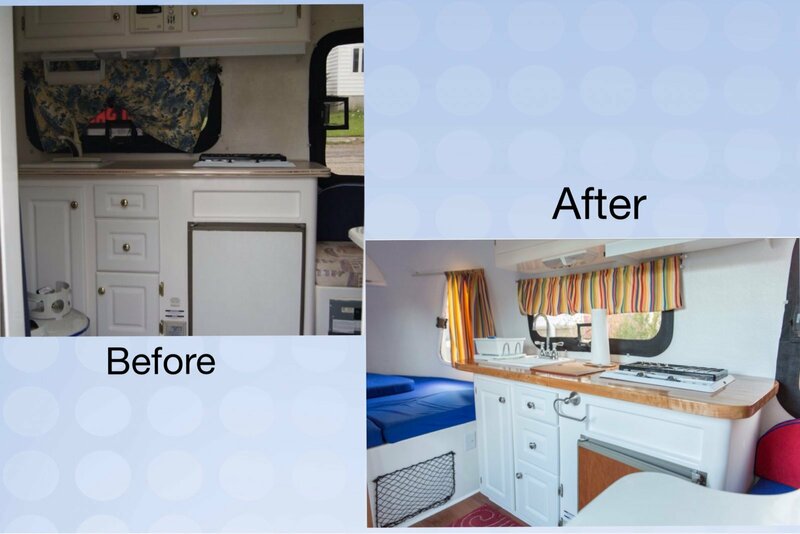 The interior work is pretty close to complete. I have some before and after photos (on my OneDrive) and thought maybe these may help inspire someone with their own renovations - as I was inspired by some photos someone shared with me. If anyone has any questions, I'm happy to answer. Thanks very much John. That's not too far away from me. 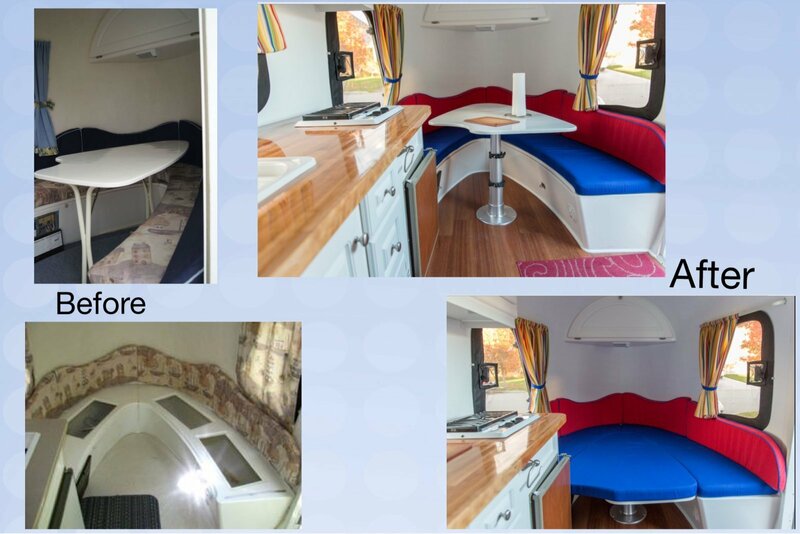 Nice job on the interior.. looks like a labour of love. Not sure what you mean by "Clear coat". I'm guessing it's some type of protective film. I have an O2 and the outside finish is white gel coat. If you could post some pics it may give a better idea of the problem. Also if you plan to pull the frame for refinishing. I can give you some suggestions. Sorry for the late reply. Here is a link to the picture that shows the problem. The (dirty) rain water is working it's way under the clear coat and over the gelcoat. Are you interested in selling ... I am willing to pay a really good price. Just found one after 2 years search ! Bought one yesterday, color is grey and it is in really great condition. Previous owner took great care of his well pampered baby. For now, I will check in depth what is working or not, tires and brakes will be changed this week before I pick it up. Next step is to add a shower drain to transform it into a wet toilet, seems to be a not too complicated task. Seller had all the original paperwork including original brochure, if interested I will send you pdf copies... And to all Bonair oxygen owners on request. Welcome to FGRV Antonius. That's an interesting mounting for the awning. This awning is not factory original, it was an add-on by the previous owner, I don't know yet if it works or may be replaced. I just wanted the ''egg''. An ecological ultra-light camper, no need to pull it with a monster pick-up... Well some Canadians think small is beautiful! Don't get me wrong, I can afford a 35' fifth wheel but we like it this way. An egg that will last longer than us... Cheers from Montreal! Congratulations on your new purchase Antonius. Looks great. Hope you have many happy adventures with it. In addition to the tires and brakes, I recommend that you look at the battery and the power converter. The original power converter (MagneTek Power Converter 6325) is an old and poor design. It killed my new battery in 1 year due to its inability to shut off once the battery is charged. Installation is not too complicated. Many thanks for the infos! I will certainly take a look to the power converter.... How much cost the replacement you suggest? I will also install a shower and drain (fortunately toilet has a door, not a curtain). Did you installed a shower on yours? Was it easy? Also, I've read that I should bring it to a boat specialist to renew the Gelcoat because it seems that car wax is not recommended... Any advice? Once I pick it up next friday, I can send you a PDF of the brochure and other paperwork should you need them.